Pleasant enough day today. Left the picnic site before anyone came along and enjoyed the steep downhill towards Kington. Kington is a lovely little town and we enjoyed buying meat from the butcher, bread and cakes from the baker, vegetables from the grocer. From there we went south to cross the Wye at a toll bridge (5p each for bicycles!) and down the Golden Valley. We considered the Sustrans route over the Black Mountains but the weather didn't look very promising and the hill looked horrendous. Pretty soon it began raining but we spotted a handy bus shelter with bench and spent forty minutes there, brewing up and eating our lunch. It didn't stop raining but we had to go on eventually. Later in the day we stopped at a campsite near Vowchurch to ask if the campsite by Abbey Dore still existed. We found that it had closed but it was too early to stop so we carried on to get here about 5:30pm, quite tired and ready to camp. Here is a convenient grown over track leading up from the road into the trees, our third fly-camp in a row, if we carry on like this we will be able to afford to cycle round the world for ten years! We had arranged to meet Ju's father John today so we got up a little earlier to be sure of getting to the agreed place in time. The hill out of Monmouth towards Trelleck was a real killer but John was climbing something similar from Chepstow so we met as agreed near Trelleck. Keen to make up for missing out on touring last week because of my Grandfather's funeral, he insisted on relieving Ju of most of her luggage. She in turn took some of mine so I wasn't complaining! 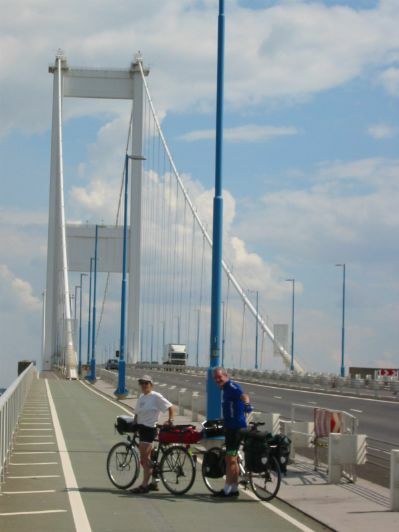 Crossing the Severn bridge was great and we stopped to chat to some maintenance guys who told us that there were 2600km of cable holding it all up. Got to Yate in good time to Ju's parents' house, a welcome shower and an enormous meal. Took all morning to collect our belongings together and get going. This gave John time for a few hours kip after his night shift and to get ready for a day ride himself. We left about 2pm with John leading the way to the Bristol - Bath cycle path. 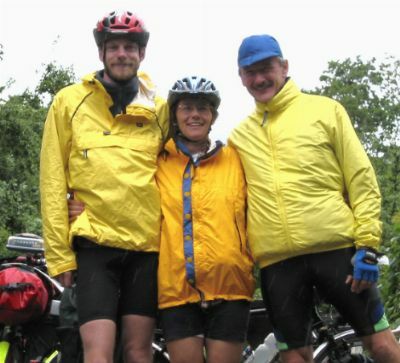 We stopped by a pub near Saltford for a final drink and because it had begun to rain. It continued to rain so we had another final drink (a coffee this time because we were getting cold) and then left John to pedal home by himself in the rain while we continued. We'd spotted this picnic site as a likely place on a detailed map before we left Bristol. When we arrived (in the rain) it looked perfect, deserted and little used, we were sure of a quiet night. Once it was dark though several car loads of youth arrived to 'hang out' and do whatever youth do in a deserted car park in the rain (it isn't hard to guess). They left us alone though and went home by midnight. The bad news from yesterday was that despite a six day break for my Grandfather's funeral and five days in Bristol, Juliette's knee had still not fully recovered from being strained on the second proper day's riding. It didn't hurt until halfway through yesterday but we didn't fancy it getting worse when we were far away, whereas at the moment it was easy enough to go back to Bristol and find a physio. We got the phone number of one in Yate and Ju spoke to him and concluded that it needed treating sooner rather than later and for at least a week to do any good. So home we went... ...after all we'd said goodbye to my folks twice so it was only right to have two leavings from Ju's ! The ride should be continued before the end of the month.